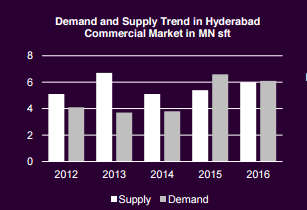 Factors such as relatively lower rentals, favourable business environment and availability of quality office spaces are attracting new commercial brands and developers to the 'City of Nizams', Hyderabad. The influx would not only improve the city’s commercial sentiment but would also enhance the housing market, especially along the IT belts. Recording nearly six million sq ft of office space leasing in 2016, Hyderabad has remained one of the top performers in the country, standing much ahead of the noted metros such as Mumbai and Kolkata that witnessed only 2.75 m sq ft and 1.5 m sq ft of workplace absorption, respectively. The city emerged as one of the most sought-after commercial markets backed by competitive leasing rates, favourable business environment and supply of quality office spaces. According to a report by Colliers International, the city recorded a 37 percent hike in the total leasing activity as compared to the previous year. A similar scenario would be visible in the forthcoming quarters as new brands are likely to expand across the market especially in the IT and pharmaceutical sector. IT/ITeS garnered 85 percent of office space absorption in 2016 and a similar situation would continue in the upcoming quarters, especially along the IT belts. “With the highest number of special economic zones (SEZ) situated in the peripheral pockets of the city, commercial leasing towards the fringes are likely to pick up pace. Micro-markets such as Uppal, Pocharam, Kukatpally, Gachibowli, Madhapur and Cyberabad could be the potential performers owing to sound infrastructure and affordable rate cards,” shares Manju Yagnik, Vice President, Nahar Group. Retail expansion is also on the cards. Eight shopping malls are likely to become operational in Hyderabad spanning over 2.6 million sq ft. Most of the malls are planned in the Northwest zone. Increased interest of institutional investors and inadequate supply against demand has encouraged developer’s participation in the retail industry. Overall, 10.86 million sq ft of retail expansion is anticipated across all metros and Hyderabad remains the frontrunner with the maximum retail development. Policy reforms and political stability has triggered growth in industrial and warehousing markets. Shamshabad, Mahabubnagar and Medchal remained major warehousing hubs in 2016 as these areas have the presence of almost all major FMCG and e-retail players. More new warehouse spaces are anticipated to function in these areas once Goods and Service Tax (GST) is rolled out. With existing firms expanding their operations and new companies entering the market, demand for office spaces would surge, however, the overall supply remains weak. Besides, pre-let transactions also impact overall availability, which has inspired developers to foray in to the market. Many commercial developers have shifted their focus from other commercial markets such as Bangalore to Hyderabad. Companies such as Divya Sree Developers, Salarpuria Sattva, Embassy and RMZ Corp are contemplating to build up their commercial portfolio in the city. Industry stalwarts opine that the investment in commercial market would further increase with clarity on Real Estate Investment Trusts (REITs) as the government is mulling over taxation and other issues pertinent to its implementation. Commercial expansion would tremendously improve housing sentiment in the city, particularly areas close to development. Anticipated markets include Kondapur, Gachibowli, Chandanagar, Kukatpally, HI-Tech and Madhapur. As these pockets are relatively priced, provide supportive infrastructure and offer array of different property types to professionals in vicinity to their office spaces, housing demand is likely to grow. Presently, property rates in these areas vary between Rs 3,000 per sq ft and Rs 4,000 per sq ft.